MySolidWorks 101 -- How can MySolidWorks Prepare me for the CSWA? Welcome back! 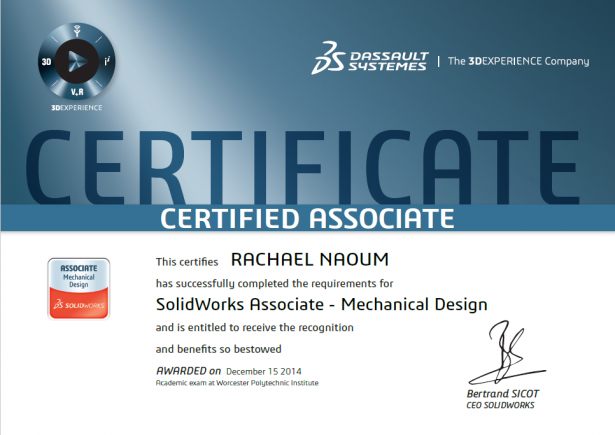 Alright, you know a few things about using SOLIDWORKS and now you’re thinking about becoming a Certified SOLIDWORKS Associate (CSWA) so you can increase your chances of getting a job, but you could use some guidance. I’ll start off by talking about the exam itself. The CSWA has two segments, each an hour and a half long. The first segment tests your knowledge about part-making and your ability to read drawings. The second segment consists of assemblies and more complicated parts. I know this sounds vague, and that’s why I’m going to tell you the benefits of the CSWA Exam Prep Course on MySolidWorks for Students. For information on MySolidWorks for Students accounts and eligibility click here. To go directly to the MySolidWorks for Students page, click here. Luckily for you, all of these items have tutorial videos and interactive lessons on MySolidWorks. If you are learning how to use SOLIDWORKS in school, that’s even better! With an instructor and probably a textbook to guide you, these online courses are sure to help you succeed. Okay, now you’re prepared for the test, but you have no idea how to take it. Depending on what school you are at, the CSWA exam could very well be your final exam. The Introduction to Computer Aided Design course (ES 1310) at WPI is a good example where this is true. If your school also offers the exam in class, you should be able to take it for free. If your school does not currently offer the CSWA exam, your instructor can apply to become an exam provider here. Once you’ve determined how you are going to get the exam, you need to go to the SOLIDWORKS Certification Center. Here you need to make an account, which your instructor will tell you how to do. This account can be connected to your LinkedIn account if you so choose, which is a great way for employers to find you. You can also choose to display your credentials. This puts your name on an international list of certified SOLIDWORKS users. As you can see, there are over 100K CSWAs in the world. And don’t worry if you don’t want to share, you will only show up on the list if you have a certificate and if you selected the option to share your accomplishment. Now this raises the question of what happens if you fail the CSWA. Again, don’t panic! Many people fail the first time, usually for a very minor and stupid reason. To make you feel better about yourselves, I’ll tell you that I failed the second segment my first time because I didn’t realize you could zoom in on the diagrams, which made me measure the wrong length. If you fail for whatever reason, you just need to wait 30 days and then you can retake it. For those of you taking the exam in school, the easiest way is to wait until the next round of finals and ask the professor if you can try again. Congratulations!!! You’ve passed your CSWA and now you want to pursue higher certifications, like the CSWP. Starting this year, schools which subscribe to SOLIDWORKS and provide CSWA exams can also provide CSWP exams. Be aware that MySolidWorks for Students does not provide CSWP content. You will need a Professional account in order to access that. Also be aware that students must pass their CSWA before they take their CSWP. If you try to skip the CSWA you will not be allowed to take the CSWP through your school. I wish all of you the best of luck getting your certifications and I hope that this article was helpful. Remember, it’s okay to fail the first time. If Thomas Edison can fail 700 times to invent the light bulb and not give up, you can retake the CSWA two or three times and be fine.